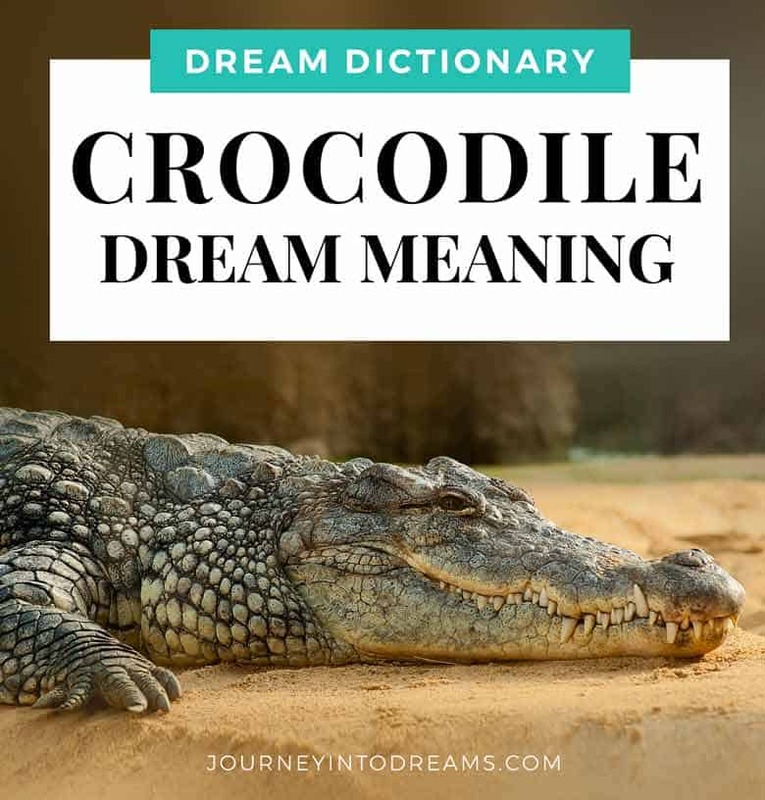 Dreaming about alligators or crocodiles can mean several different things. Sometimes it can be scary, other times it can be adventurous or even exciting. Today we'll take a look at what it means to dream about an alligator or a crocodile. And yes, we do know that alligators and crocodiles are not the same! However, they are closely related animals and many people often confuse alligators and crocodiles with one another. For these reasons, we decided it only made sense to cover them both at the same time. For most people, the symbolism is going to be the same, whether you dream of one or the other. The key differences to consider is if your life might have specific personal meaning. For example, you work with crocodiles at a zoo, or you live in a place where alligators are in your backyard, or you are on a sports team where your team mascot is a Gator. Still, you are going to notice most of these things are all very common for either type of animal. The key to help you understand the most about this dream is the context in which the alligator appears. This is why it is important to first write down all of the details and the things you remember about it. The next thing to do is really think about how you feel about the dream and how you felt during the dream. Are you afraid of alligators? Are you excited and happy about seeing a crocodile? Were you in a peaceful river, or were you in a strange place where reptiles are not to be expected, like on a subway train in the middle of the city? Paying attention to your feelings and other symbols in the dream will give you a good start in interpreting the meaning of alligators and crocodiles. What Does it Mean to Dream About an Alligator or a Crocodile? In most cases, dreaming about a crocodile or dreaming about an alligator will have a similar meaning. While the two animals are different from one another, they both share a lot of the same characteristics and symbolism. Alligators typically have a broader, rounded and U-shaped snout, whereas crocodiles have a skinnier and V-shaped head. These large reptiles are well known for living in swampy areas as well as along places where there is water and tall grasses. They are very good at blending in with the environment to hide while hunting. These animals can be quite aggressive and dangerous in the wild or even when held in captivity. Research done by Dr. Gregory M. Erickson shows these large reptilian creatures could even be possibly more dangerous and threatening than a T-rex if a T-rex were to still exist today. How crazy is that? Needless to say, for many people, dreaming of these animals can be a frightening and worrisome experience. If you have feelings of worry or fear when you see one in a dream, be assured that is definitely a very normal response! Most of us who live in the cities and suburbs do not typically encounter a gator or croc while we are out and about in our regular daily routines, though we may occasionally see them at zoos, theme parks or even in different areas where we travel where the creatures are native to the environment. I would say that 98% of people I talk to who dream about a crocodile are quite scared when one appears in a dream. Often times these animals come out of nowhere, have some very ferocious looking teeth, and they may even chase you in the dream. If you have feelings of fear while you are dreaming, it often means there is something lurking in your daily life that you are afraid of confronting and dealing with. It may be something you are not aware of - or you may be afraid of unexpected news or uncertain outcomes. While it can be scary to face our fears, the message of this animal is to remind you to be vigilant and to not ignore any potential warning signals. Ignoring your intuition could mean not getting the results you want to achieve. Many common nightmares involve these animals - and even I on occasion will see these animals in my dreams, especially when I am well aware there are things I'd rather not deal with emotionally or have a lot of challenges going on in life. Fortunately, there are a lot of great ways to stop and prevent nightmares if you have a lot of dreams about these scary situations. 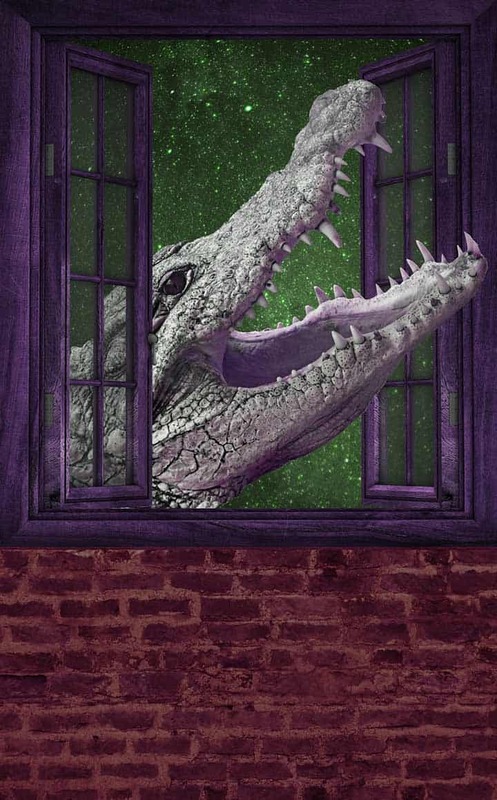 If you associate crocodiles with risk and the unknown, it is quite likely that it may appear as a symbol in a dream when you are faced with making new choices or if your life has become a little bit too routine. Alligators and crocodiles can symbolize a need for adventure and excitement in our lives. Think about popular adventure and action films and tv shows - often times a crocodile makes an appearance! Pay attention to your overall dream mood and feelings - did you feel a rush of excitement when you saw the crocodile/alligator? Were you filled with wonder or awe? If you did, it could mean you are looking for something new or interesting to do. While this could mean that you are ignoring your emotions in some instances depending on the context of the other dream events, in many cases this is a symbol for resiliency. This means that you are able to deal with challenges, even though it may not be a pleasant experience. The phrase "thick skinned" means that you are able to easily handle criticism and complaints. It is not easy to hurt your feelings. You don't take things too personally and are able to understand that you can't control others, but you can control yourself and your own thoughts and feelings. However - keep in mind sometimes our dreams mean the exact opposite! Occasionally, this can also mean that are you being insensitive to what others might think or feel. The phrase "crocodile tears" means to cry falsely. Sometimes when you dream of a crocodile it can mean that you are not being true to yourself. You may act one way or pretend one thing when your true subconscious feelings are opposite of what you want to believe. This could indicate you are not really being honest with yourself, or you are denying yourself from your true emotions about a situation in your current life. Sometimes this symbol when appear when people are dealing with business matters and are not sure whether or not to trust someone. Not too many people would willingly trust a crocodile or alligator, and it could mean that you are unsure about whether to trust yourself or someone else, especially in business dealings. Alligators and crocodiles often hide in the water, waiting for their prey. You never know what may be lurking beneath the surface! Therefore, it is logical that your dreams may mean concealment or hiding of something. As mentioned earlier, this could mean that you are not sure if you can trust someone or something in your life. It might seem like someone is hiding the truth from you. Sometimes, we tend to cover up our own feelings. It's easy to bury these old emotions down deep and hope they never resurface - but that is typically not the case of what happens. Usually these repressed emotions end up quite literally "snapping up" to the surface at the worst possible times. However, not all surprises are bad ones. Sometimes this could be a sign that you are ready for something new or are willing to leap into new opportunities. We also have many hidden talents and skills that we don't always acknowledge or celebrate. The alligator and crocodile are often assigned as power animals in spiritual healing sessions because they are quite strong and mighty. They may be there to help you feel more confident and resilient in your life and to take advantage of your own inner power and wisdom. There are a lot of possible scenarios where you might encounter this in a dream at night while you are sleeping. It is most helpful to see different dream examples and dream interpretations to best understand in context what different things might mean. 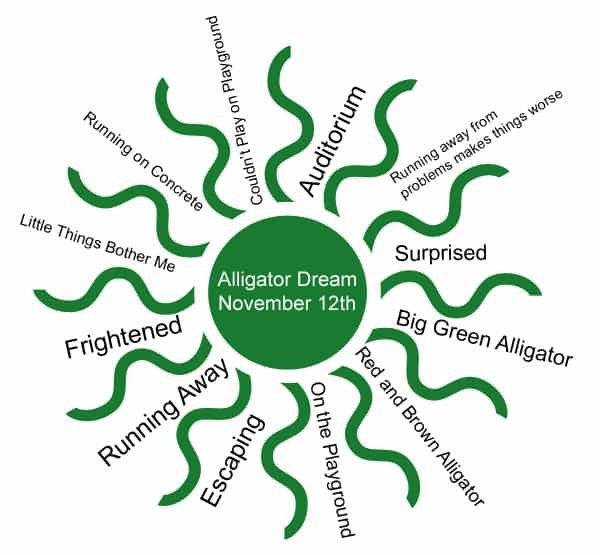 In our post on how to mind map your dreams for dream interpretation, we share this simple example of a dream involving alligators, as well as how we used a mind map to determine the significance of the dream. Doing this mind map shown here helped us understand what could have been a terrifying dream and how it related to the current events happening in life. On our website, we have many different examples and tips for learning how to interpret your dreams successfully and use these interpretations for personal development and spiritual growth. Using different dream interpretation techniques and tools, such as mind maps or even drawing a picture can help you understand a little bit more about what a dream might be about - not just for this dream symbol, but other dream symbols in the future! To dream you are being bitten by a crocodile or alligator can mean that you are being warned about a looming threat or danger. It could also mean that you need to be more aware of possible problems. Ask yourself: Are you ignoring something you should pay better attention to? Snapping Alligator/Crocodile: If the alligator or crocodile is snapping at you, it may mean that something you have been ignoring needs your attention, or it could signify that you or someone you know has been irritable and easily agitated. Fighting an Alligator: Fighting an alligator or crocodile in your dream can mean that you are facing and confronting your fears, or that you are not afraid of danger. It can also symbolize that your are having an inner struggle of some sorts. Being Attacked: Dreaming of an attack can be a very scary thing! If you feel like you are being attacked, it could mean that you are unsure about whether or not you can trust someone or something in your life. Remember what we said about crocodiles being thick skinned earlier? In these cases, dreaming of being attacked could mean that you are developing resiliency and being challenged in some way in your waking life. If you dream of being killed by one of these large reptile creatures, this could sometimes signify that you feel out of control about a situation. You may feel like you do not have the ability to escape or change the situation. Death in our dreams often relates as a symbol for transformation and change - and sometimes when this happens in a dream it can also mean we feel reluctant about changes coming up in our lives. You could also possibly be scared that maybe you are in some sort of danger. Fortunately, most types of these dreams are not prophetic in nature, which means they do not predict the future. In most cases, learning the symbols for the dream meaning of death will usually help calm your worry. On the other hand, if you dream that you kill an alligator or crocodile, this could potentially mean that you feel like you are able to handle any type of challenge that may come your way. You may have confidence that even if something is difficult, you will succeed in the end. If you feel relief or gladness, it may also mean that you recently overcame something difficult, and now you are feeling the accomplishment and satisfaction of knowing you were able to get through the challenge. Think of the slang term, "killing it" - this means to achieve success. See Related: Dream Meaning for Killing. Water in our dreams is almost always associated with emotions. If you see an alligator swimming in the water, it could mean that you are afraid of dealing with emotions or confronting fears. 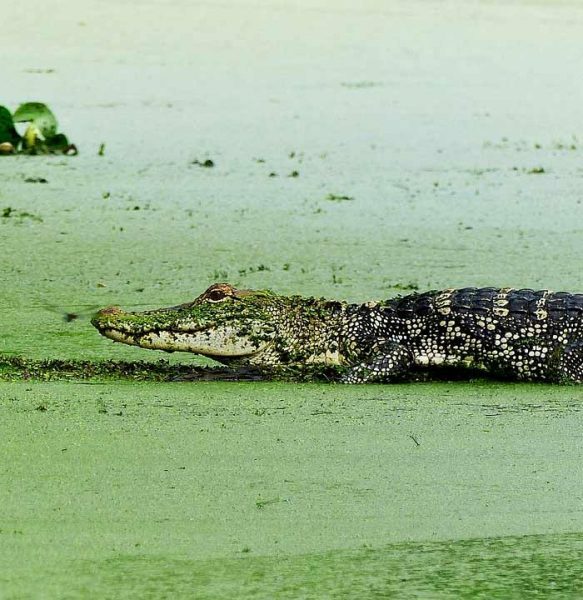 If you see the crocodile or alligator is on the edge of the water, such as on a river bank, this could symbolize that you are not sure of your feelings in regard to a decision. 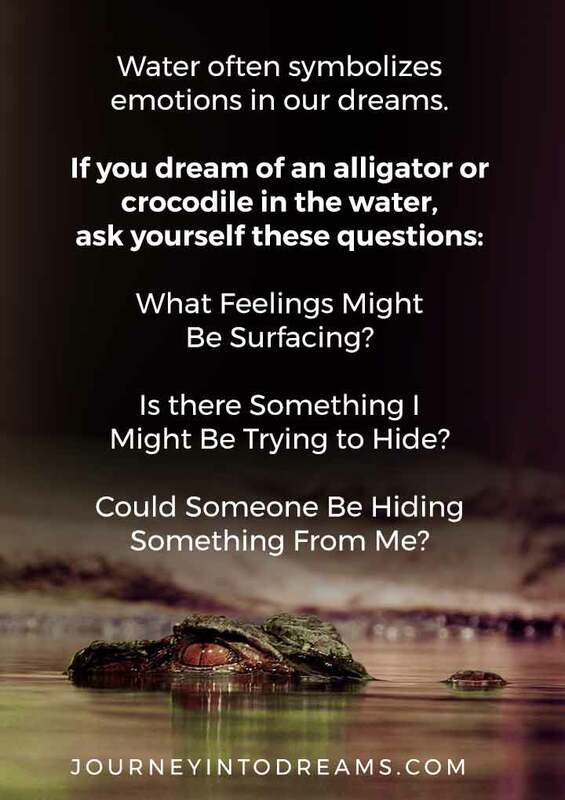 To dream of swimming with an alligator or crocodile could mean your emotional needs are not being met, that you are afraid of expressing your emotions to someone, or are not acknowledging how you really feel about a situation. Sometimes, this could also mean that you have feelings of being afraid of whether or not you can trust someone. You may feel like someone could sneak up on you or surprise you with unexpected news. You may also afraid of facing the truth about a situation. Are you being honest with yourself and others? Ask Yourself: What Are the Characteristics of the Water? The type of water you notice can make a difference for what this dream could possibly mean. For example, if you dream you are in a swimming pool and doing synchronized dives together, this is a big difference that what it means to swim with an alligator in a muddy river! Muddy water could mean confusion or uncertainty. Crystal clear blue water could mean that you are allowing repressed emotions to finally come to surface and you are ready and able to confront these fears and deal with the difficult feelings you may have been avoiding in the past. 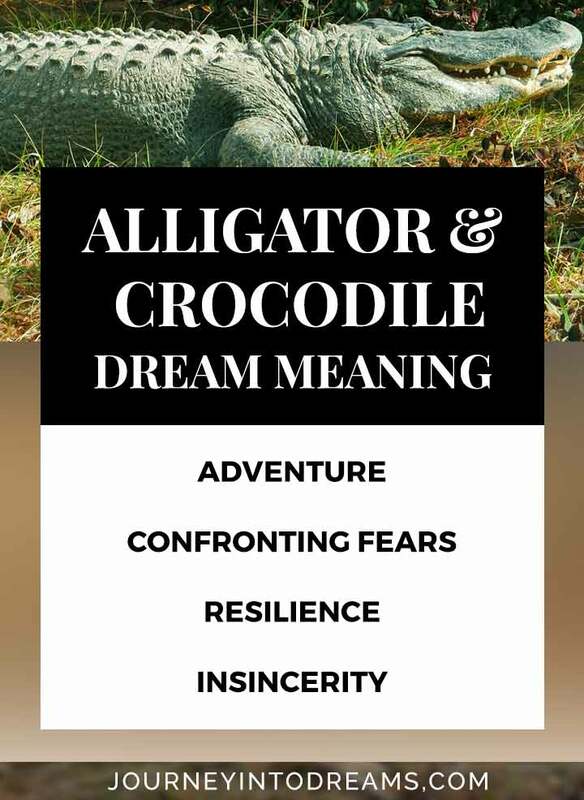 To dream you are running away from a crocodile or alligator means you are afraid of confronting a fear or you may want to try to escape a difficult situation you are experiencing. Being chased in a dream is a very common theme that many of us experience. What fear you are afraid of confronting will greatly depend on what events might be happening in your current life and other parts of the dream. You also may sometimes dream of a whirlpool or being dragged underwater in these types of dreams. This is especially true if you feel like your responsibilities are currently overwhelming. Maybe things at work or your home and personal life are starting to wear down on you. Maybe you feel like you have no way to improve a situation. Maybe you are not seeing the type of progress you want to achieve with your current goals. Understanding what it means to be dreaming of being trapped can give you a lot more insight on what it could possibly symbolize if this is a mood that you notice. Ask yourself: Do you feel like you are stuck in a situation and are unsure of how to get out of it? Alligators and Crocodiles are extremely protective of their young. In ancient Egypt, these animals were once believed to be a symbol of fertility. Dreaming of eggs could potentially mean that you are excited about new beginnings or have some hidden worries about new changes happening in your life. For some, an alligator or crocodile could represent being over protective of a child, or it could mean something to signify your role as a mother in your life. Related Posts: You may wish to look at What it Means to Dream of Babies and Dreaming of Pregnancy. Sometimes, this could also be a sign that you are in need to get in touch with your own playful self. Are you spending too much time wrapped up in responsibilities? Do you need some time for self care? Could it mean that you are not having enough fun in your current daily life. Sometimes, this could also indicate an element of surprise in your life. Maybe things are too predictable and you need a change. Identifying our feelings and the tone of the dream is so very, very important. Often times feelings are all you need to begin to truly understand what underlying meaning could be. What we feel during our daily waking lives, even if subconscious, will usually manifest in some way in what we experience at night while sleeping. Think about any thoughts and feelings that occurred. Were you frightened? Did you run away? Did you try to fight the things that were scaring you? Did you face it head on? Being in tune to your feelings about the alligator can help you better understand what it means in your dream. What Colors Were Present in the Dream? Most alligators and crocodiles are brown, gray and green, but in dreams they can be a number of different colors. It's not unusual to dream of something in a completely different color than what might be expected or normal! In other instances, the color of the animal might not be all that important, but perhaps there is a color of something else that is extremely vivid. You might notice a bright red ball bouncing in the water for example, or you might remember seeing a big yellow sun in the sky. Learning the symbolism of these different colors can give you a lot of insight on how it all may relate to your current daily waking life. See Color Symbolism and Meanings to understand colors in your dream. What Are Some Words You Would Use to Describe the Crocodile/Alligator? Try to describe the alligator or crocodile as much as possible. Was it big or small? Was it ferocious or calm? Did it snap at you or was it just there minding its own business? Think carefully about what actions were taking place in your dream. These actions will often give you some important clues to interpreting what the dream could mean. Is there anything happening in your current life? Often times our dreams are a way to process our current feelings and all the things we encounter in our daily waking lives. Was there anything recent that made you feel insecure, afraid, anxious, uncertain, or challenged recently? It is always interesting to learn about what others might experience in their dreams. If you have had a dream about an alligator or crocodile, feel free to share what you might recall about the event in the comments section below. We'd also love to hear if you have any of your own person associations for dream interpretation symbols for alligators and crocodiles. Is there anything we might have missed? Your thoughts and comments are always welcomed! I can not find relevant information to this anywhere. A little insight, please? I dreamed that I was holding a baby crocodile in my hands as I waded through a murky desert river looking for a safe place to return the crocodile to the wild. I passed at least three tributaries and asked three people where to put the croc. At the end of the dream, I could not find a safe place to put the croc because I was concerned with the chaos the croc might later bring to people. What about seeing an alligator/crocodile attacking something/someone else, not at you and at the same time, you don’t want to watch this animal devouring its prey? So it is not directly to you, but you look away trying to cover your child’s eyes from the awful sight. I HAD A DREAM AND AT A PART I SAW AN ALLEGATOR LIED ABOVE AND AT MY FRONT. THE WERE SOME PEOPLE MOVING AROUND AND IT TOLD ME THAT, “IT SPARED THEIR LIFE BY KILLING THEM, BUT IF THEY DO NOT KNOW AND THEY TOUCH IT YOUNG ONES IT WILL KILL THEM.” IT YOUNG ONES ARE FOUR. THE YOUNG ONES AND THEIR MOTHER ARE ALL GREEN. PLEASE THIS WAS MY DREAM SO, HELP ME UNDERSTAND IT. i had a dream i was in a swamp surrounded by a plethora of albino crocodiles. they were jus laying there as if sun bathing. then i ventured to the water where my older brother jumped in and was almost eaten by an alligator. he kept encouraging me not to be afraid and to come in the water. as soon as i walked in the water a crocodile bit me on the arm and i forcefully threw it off and it jus disappeared from the dream and i awoke. my brother was almost eaten by an albino crocodile same as in the dream the whole time, not an alligator sorry. i had a dream were i was with my family and friends im my house and a crocadile got in my back yard and started to suround my mom the crocadile or gator was thick with realy dark green skin color and it was really big and it started to bite one of my moms feet but someone came toock the gator away and started to kick the gator in the face so i joined that pearson and started to kick the gator in the face to but i never find out who is the pearson. What if you saved someone else from an alligator but you were terrified of it? And they were baby alligators , and the other people in my dream were not afraid of the alligators at all. Dream was placed at a beach house in Florida. Almost the same dream. In my dream, my uncle was almost bitten by this huge crocodile, after that, my uncle swam with the crocodiles for no particular reason and he got eaten. The alligator in my dream was calm and smaller or medium sized and it was in my yard like next to a pool and I think I was taming it. I was cautious but not afraid of it. I’m not sure if it has to do with my worry over my son’s addiction or my relationships with the hurt/scared men I attract and spend years taming. Its dark cold and raining as always. I’m in what looks like a large black river in witch i have to cross. there will be a bridge but the water is high and its almost washing over .The black in color Croc seems to be lying next to or under the bridge..waiting for me to cross. Even if i can’t see it.. i know its there!!! so i always hop over the bridge and thats when the massive Black Croc stirkes. Snapping and chasing me, though the Croc never actually bites or catches me it comes very close. I had a dream. In that I saw single small 3 to 4 feet sized crocodile swimming inside a tank. At that time I thought that it should’nt cause any danger to my uncle. Then I saw the crock came out of water and ran out of my house’s compound and my sight. During the dream and after that I had a calm state of mind i.e. without any panic or fear. But I did concerned about my uncle’s safety. Any one Kindly explain me about this dream and it’s message. I had dream that my little sister and the guy i don’t know fall into the river with full of crocodile and it was huge.My little sister got eaten by crocodile alive and the guy that fall with her manage to save his self by climbing the tree.I keep calling my parent for help and they ignore me then i woke up from sleep. I had a dream where I was on a kayak with some of my family squished on in a swampy area. The whole time I was afraid of getting hurt by a croc. Near the end, one snapped at me, but didnt bite me. Also, when we got back to the dock (where we started) one of my cousins who went on a different kayak exclaimed she had gotten scraped by one, but the injury was very tiny. She seemed like she was over reacting. I had a dream where I was walking on sand, which gave way to mud, then water with crocodiles under the surface. This was next to a very tall building with straight sides which I started to climb but did not get very high off the water. I then was thrown a rope which I climbed. The crocodiles where jumping out of the water and trying to eat me. The whole dream was so terrifying as my arms got fatigued near top of rope and I could not pull myself over top of building edge. i dream i was in a small pond and i was surrounded by 5 white crocodiles staring at me and another 5 brown or black,the brown or black bit me on the stomach and it stopped like looking at me and but my stomach was still stuck on his mouth on the right side,i felt like more shocked than fear,some how i got liberated and walked away.What means ? I had a dream where I was visiting my parents home and there were aligators everywhere! Big ones and small ones. They where the normal color, and mostly just laying around relaxing. They would only snap at people when you tried to move them. There was someone there hired to get rid of them, but I was still terrified. Everyone else seemed only mildly worried.